As the longest government shutdown in U.S. history approaches its fifth week, economists warn of its increased risk to the economy. 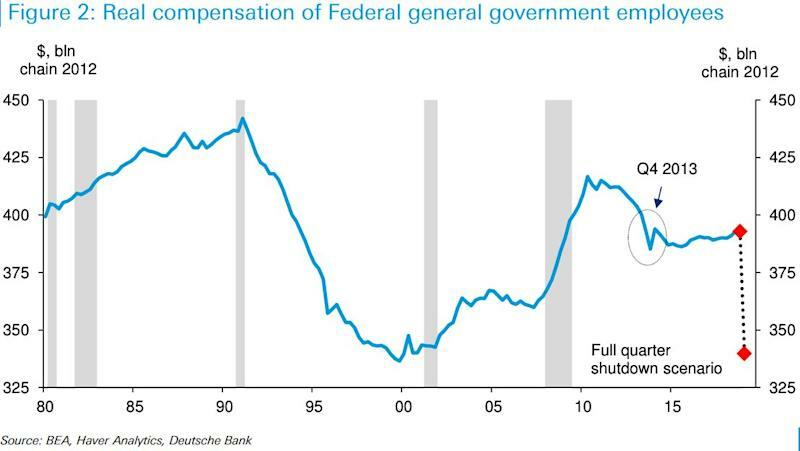 “Government shutdown poses a meaningful risk to Q1 GDP,” Brett Ryan, senior U.S. economist at Deutsche Bank, wrote in a note on Thursday. New York Federal Reserve President John Williams also warned that the shutdown has “a significant impact on the economy by creating a drag on consumer spending and raising people's uncertainty” when he spoke on Friday. The shutdown, usually seen as a temporary disruption to the economy, doesn’t always cause serious concern. A week-long government shutdown could have a very modest impact on GDP growth. That’s why some were optimistic about the situation in late December. “The economic implications are very limited,” wrote economists at Goldman Sachs in a note last month. But one month into the shutdown, the picture looks very different. Government workers are setting up online fundraising pages to make ends meet and small businesses are losing government contracts. The latest University of Michigan consumer sentiment index released Friday fell to its lowest level since October 2016, and is seen as a sign that “the government shutdown is negatively impacting consumer attitudes, wrote JPMorgan economist Daniel Silver. President Donald Trump even canceled his trip to the World Economic Forum in Davos, Switzerland so he could remain in Washington to negotiate a deal to reopen government, but there is no end in sight for the shutdown. Economists at Deutsche Bank estimate that the government shutdown will drag the real GDP growth for the first quarter down by approximate 0.2 to 0.3 percentage points, assuming the government reopens by the end of next week (January 26). If the shutdown were to last for the first three months of the year, it could subtract around a full percentage point from first quarter inflation-adjusted output growth. That only calculates the impact on federal employees, who will get back pay when the government reopens. There are an estimated 800,000 employees in nine federal agencies who are currently not being paid, including 380,000 who are furloughed without pay. The real impact could be much larger, taking the private-sector government contractors into consideration. Deutsche Bank said there could be another 2.08 million private-sector workers who will not be paid over the shutdown period, which could subtract 1.02 percentage points from first quarter growth. Unlike federal employees who will eventually get paid, contractors will simply miss paychecks because fewer contract jobs are available, which may have a multiplier effect in the economy.